Life Sciences is a multi-billion dollar, global business. With an economy worth more than £200 billion a year, the Midlands has become a real focus for UK Life Science research and business growth. From Med-Tech to Bio, the Midlands offers a strong support network to businesses moving into the region. With specialist sector knowledge and comprehensive local networks across the region, Medilink Midlands are actively supporting the Department of International Trade (DIT) to attract and successfully establish foreign owned Life Science businesses into the Midlands region. Situated in the centre of the UK, the Midlands is the heartbeat of the nation’s economy and the ideal location for Life Sciences businesses; understand the numerous reasons why the Midlands has over 1,100 life sciences businesses and supports over 30,565 high skilled jobs. 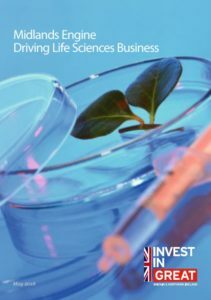 Discover why your business should be established in the Midlands region by reading Midlands Engine – Driving Life Sciences Businesses. Download your copy here. Contact a friendly member of staff to get more information about us, our events and partners.